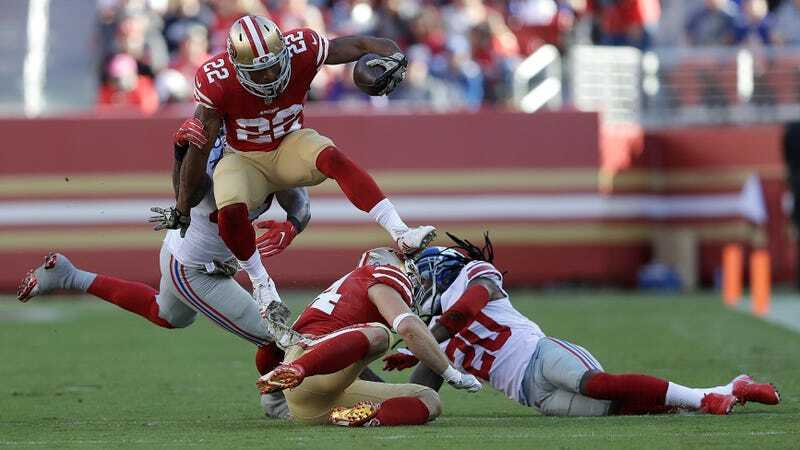 The San Francisco 49ers earned their first win of the season today, in Week 10, by beating the Giants 31-21. And yes, it still counts as a win even if it’s against Ben McAdoo’s band of injured skill players and demotivated defensemen. Led by a quarterback they don’t even plan to start in two weeks, the Niners played their best game of the season, gaining 474 yards while holding New York scoreless in the second half until a garbage-time touchdown with a minute left. It wasn’t a spectacular game, but one great play came in the second quarter, when San Francisco’s C.J. Beathard looked like a true NFL starting quarterback, delivering one of his three total TDs with an on-target bomb to Marquise Goodwin for an 83-yard score. Also making an appearance was tight end Garrett Celek, who, after not gaining more than 24 receiving yards in any game this year, got 67 today, primarily on a 47-yard TD with a long run after the catch. The Giants have allowed an opposing tight end to score a touchdown in every game so far this season. The time of death on any remaining level of interest in the Giants’ season was about 3:53 PT, as running back Matt Breida cut through the New York defense untouched for a 33-yard score. So the Giants rescued the Niners from a winless season, and, perhaps, the Niners have rescued New York from Ben McAdoo. For those wondering (and hoping)—no, the Cleveland Browns do not play the Giants this year.